GMEL entered the country in 2007 on the potential of Kvanefjeld, which had been investigated historically for uranium. Today, following extensive exploration and metallurgical work, the project is firmly one of the world’s largest undeveloped rare earths resources. There is a JORC 2012 compliant defined resource of over 1 billion tonnes which represents only 20% of the total project area. The primary product is a variety of high-purity rare earth metals which will be supplemented by uranium and zinc as by-products. With technical assistance from Shenghe, there is also potential to recover lithium and scandium as additional by-products. “The significant elements from an economic perspective are first and foremost the rare earth metals and from a secondary perspective uranium,” explains Mair. The economic value of uranium and other by-products will place Kvanefjeld as the world’s lowest-cost producer of rare earths. The size and extent of the resource at Kvanefjeld speak for themselves. To say the resource is huge is no understatement, bear in mind the upside potential on the area, but for Mair the major focus has been to identify the most efficient and cost-effective means of processing the resource. 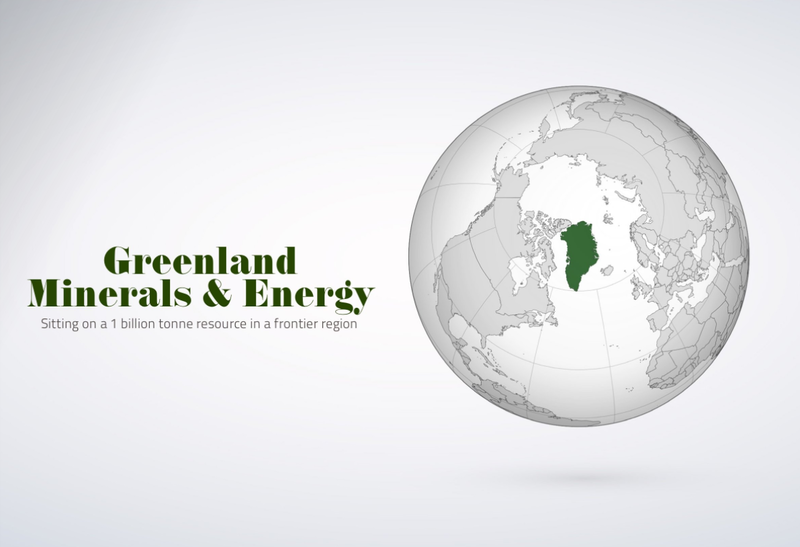 GMEL has systematically advanced the project through a resource estimate, pre-feasibility study then a definitive feasibility study, building relationships with the Greenland Government and developing a technical understanding of the resource. “Once you understand you have extensive mineral resources the question becomes ‘what can you do with it?’ and that’s a function of metallurgical processing. This has been a key focus for a number of years. Mair identified a strategy of recovering as many different elements as possible while retaining the simplest metallurgical process. The first point of metallurgical success came when GMEL found it could concentrate the value minerals in the low-grade ore body with ease. Using modern flotation techniques GMEL was able to capture the majority of rare earths and uranium in a small mass very effectively. The next steps for GMEL were to build an understanding of both the leaching process and how the processing operation could be scaled up. Having successful reduced the ore into a low mass/high grade format, ideal for hydro-metallurgical processing and reducing the cost of reagents, Mair knew the unique ore could be broken down readily in a simple weak acidic solution. The team then set about developing a metallurgical flow sheet specific to Kvanefjeld, but drawing from conventional metallurgical techniques. After establishing the concentration and metallurgical process the next stage was to scale up the test work. GMEL has conducted successful large scale pilot plants on the concentrated circuit and the leach circuit. “Every step firmed up our vision for the project that this could be a very cost-competitive, highly scalable production centre which could sustain a very long mine life,” Mair indicates Kvanefjeld could operate for more than 100 years. The result of the metallurgy work reinforced the rare earth metals as the primary focus of the project in terms of a core value driver. The market for rare earths is about potentially about to experience strong growth. The most important application of rare earths is in permanent magnets. Neodymium and Praseodymium are bulk components in permanent magnets and both are present in Kvanefjeld. The importance of permanent magnets is by their nature they are key to a number of core technologies relating to energy efficiency and electric vehicles – two sectors which are on the verge of experiencing unheralded global investment. With rare earths as the primary value driver, Kvanefjeld’s revenue will be supplemented by incredibly low-cost uranium as a by-product. Currently Uranium is facing decade-low prices but as Mair says, at a cost of $4-5 per pound to produce it will always be a revenue stream and the stronger the uranium price the stronger the revenue stream. Another key development for Kvanefjeld was the recent strategic relationship agreed with leading Chinese rare earth company Shenghe Resources. Mair had been looking for a strong global industrial partner due rare earths requiring ‘integration with strong downstream processing proficiency to create a strong business’. Shenghe has taken a 12.5% stake in GMEL and the objective of the relationship is to further reduce the cost structure at Kvanefjeld, ensure the project is ‘optimally integrated with downstream processing’ and ultimately bring Kvanefjeld into production as a leader in international rare earth supply. The work from 2007 has involved incrementally moving through the core stages at Kvanefjeld and putting the foundations in place to eventually take the project into commercial production. The combination of a definitive feasibility study and approval of the social and environmental impact assessments amount to the central planks of a mining application in accordance with Greenland’s mining regulation, says Mair. Having achieved both GMEL will be fully focused on working through the permitting process in the coming year. “All the major technical reviews are nearing completion. A lot on the environmental side which is managed by the Greenland Government and a number of technical advisers to ensure it is completed to world-leading standards,” says Mair. Mair stresses that keeping the local community, local stakeholders and domestic government well informed with clear and consistent communication is crucial to Kvanefjeld’s success. “It is a really important milestone for the company. There is a huge amount of data and work that is the culmination of many years and many millions of dollars of investment. In May, 2017, Yukiya Amano, Director General of the IAEA visited Kvanefjeld as part of an international delegation headed by Greenland’s Premier, Kim Kielsen. The visit follows work conducted by the Greenland and Danish governments in association with IAEA to establish a legal and regulatory framework to manage the production and export of uranium from Greenland. Such efforts at a political level highlight the significance of Kvanefjeld and the efforts at a political level to prepare for the projects development. GMEL entered Greenland in a time when it was looking to engage the international community with the specific intent of developing a stronger resources sector – it was actively encouraging foreign investment. Mair says the progress since then has been fascinating. The global mining boom period from 2006-2012 saw a wealth of significant deposits discovered in Greenland and at the same time it was undergoing political transition from home rule to self-rule. “As a result of being in a state of evolution we have seen a number of changes as Greenland has become more advanced in managing many aspects of the mining industry,” reflects Mair. “As a company coming from outside you step into a place like Greenland and there is a big responsibility because in areas you have to provide guidance in how things are done.